On Twitter this week, among many thousands of abusive and threatening tweets direct at the NRA’s Dana Loesch, one in particular stood out as vile and, more importantly, seemingly impermissible. Nevertheless, that tweet (quoted below), was not even considered a rules violation by Twitter until after public attention was focused on it, says Chris Loesch, Dana’s husband and manager. Loesch told Mediaite that Twitter has ignored or left unpunished other threats in the past but that, “somehow after we went public, they suddenly decided to suspend an account.” Loesch is referring to an article about the threat, and the subsequent emails from Twitter, published at the Daily Caller. The tweet in question is only available by screenshot now, since after the account was temporarily suspended, it was deleted. 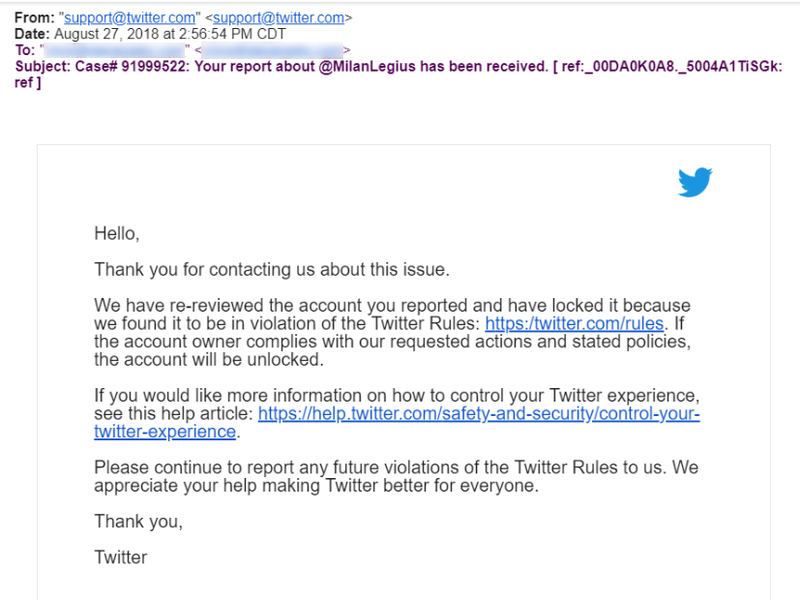 While the user, @MilanLegius, was temporarily suspended, the account is now active again. After the Daily Caller’s initial article was posted, which featured a tweet from Loesch, another email came from Twitter, this time stating they’d changed their minds. Dana and Chris Loesch did not submit a new inquiry in that interim. The second email states that if “the account owner complies with our requested actions and stated policies, the account will be unlocked.” The user’s account is currently unlocked. Amid controversy over the Twitter account of Alex Jones, Twitter announced recently they were going to take steps to further action against “hate speech”. This is a recent blog post about their evolving rules. Alex Jones was given a temporary suspension by Twitter earlier this month for a period of one week for “abusive’ behavior. That one week suspension was mocked as trivial or inadequate punishment on CNN. The user who said that the Loesch children “need” to be murdered wasn’t even gone 48 hours. President Trump and other prominent conservatives and Republican officials have questioned the company’s ability and efforts to enforce rules fairly across the ideological spectrum. In answer to that attention, Twitter CEO Jack Dorsey has made some recent rare media appearances, notably telling Fox News’ Sean Hannity that they do not make decisions based on ideology and telling CNN’s Brian Stelter that he full admits the company is left-wing, but arguing that it does not affect their ability to be fair in the application of rules. In this case there is an open question as to whether their public statements reflect any actual changes in practice. 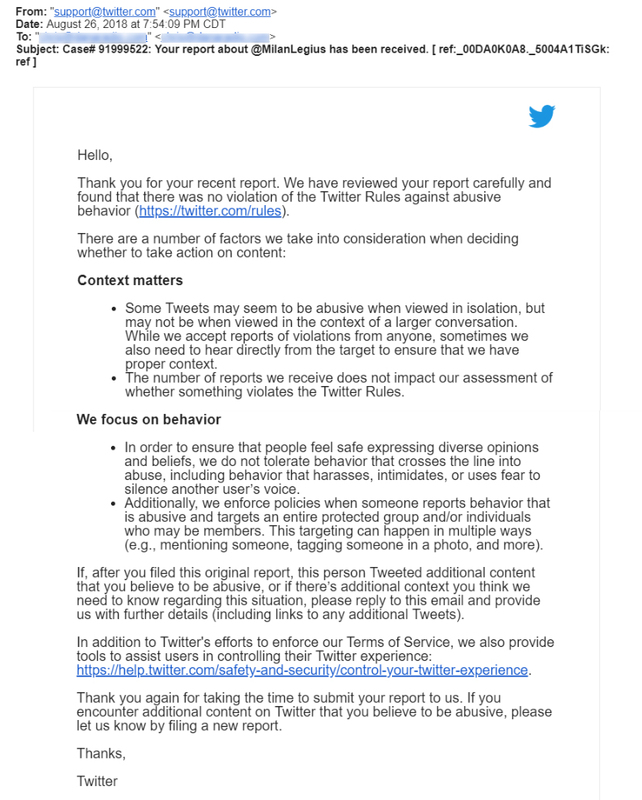 Mediaite requested a clarification and comment from Twitter regarding the two separate emails regarding the threat against Dana Loesch’s children, and the continued active account for the user who made the threat, but did not receive a reply. Loesch is also reaching out by Twitter. If, as CEO Jack Dorsey states, Twitter is “studying” the “health” of conversations on Twitter, perhaps “someone needs to murder your kids” is a good place to start looking.